Featuring 130+ different whiskies and bourbon, quality spirits, beer and wine. 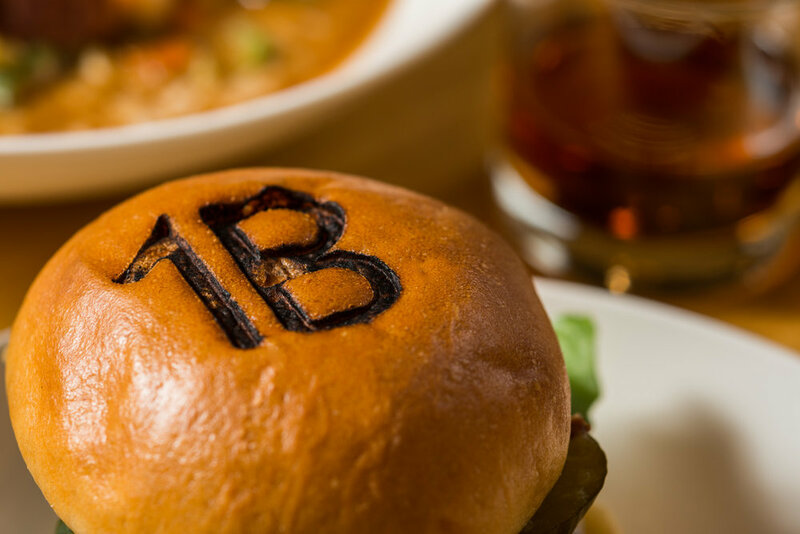 Located at 608 Bridge, One Bourbon brings the Bourbon/Whiskey movement with American regional dining to Beer City. One Bourbon’s interior reflects the hip sensibilities of the surrounding area, with loads of unfinished brick, tin ceilings and Edison lights. The multilevel restaurant offers the choice to dine in the pub area with live edge granite bar; in the main dining area with comfy seating and plenty of light; or outdoors on the large patio. The 2nd floor allows guests to observe passersby in the Oak Room (a swanky whiskey room) and the Lounge, a private dining area for your next business meeting, group dinner or get together. Seating up to 50 for a formal meal and up to 75 for cocktail style,the Lounge and Oak Room has soft seating with wing-back chairs, end tables, pub tables, and dining tables. Reservations accepted for parties of all sizes! Metered parking along North and South Side of Bridge Street. Free parking is available in the ally in the back of the restaurant and side lots (formerly 20th Century Meats and Chemical Bank). Paid parking available in public lots/ramps within 2 minute walk. Paid parking available in Bridge Street Market ramp - directly across the street. See maps at the end of the document for meter parking and public lots/ramps. 3:00pm - 6:00pm enjoy $2 off our cocktail list, and 1/2 off drafts and wines by the glass. $2 off EVERY whiskey on the brown list. 3:00pm - 10:00pm. Build your own delicious bowl of poutine heaven + either a draft or bourbon of the day for $10. Sign up with your email address to receive news and updates on GR's biggest whiskey bar! Whiskey is what beer wants to be when it grows up. Our chicken is 100% natural with no steroids or hormones. Our labor of love begins with a 24 hour brining process, then we dredge it in our secret recipe of spices and flour, followed by the final step of frying to perfection. Please note pricing on our "brown" list are for 2 ounce pours. Single-distillation from 25% each of organic rye / organic corn / organic wheat / organic barley. 1% of all sales from this whiskey goes to various golf charities/organizations to teach kids the game of golf. Buffalo Trace Distillery $18 No Distillery has earned more domestic and international accolades than Buffalo Trace. Writers, enthusiasts and spirits competitions around the globe have awarded more than 500 accolades to their brands. GEORGE THOROGOOD $15 "One bourbon, one scotch, & one beer..." Our signature flight. International Aisle $24 Take a tour around the world, whiskey style. Visit Canada, Ireland, Scotland and Taiwan. 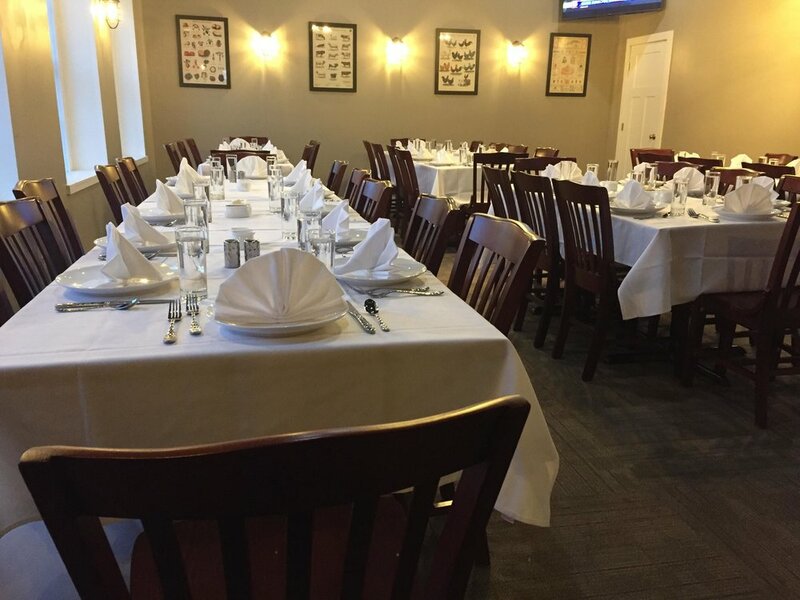 We are happy to accept reservations for parties of 2 to 16 people in our Main Dining Room. For larger parties, please see the events tab! The second floor of One Bourbon features the Lounge and Oak Room, a perfect place to host your next business meeting, celebratory get together or large dinner! Seating up to 50 for a formal meal and up to 75 for cocktail style, the Lounge and Oak Room has soft seating with wing-back chairs, end tables, pub tables, and dining tables. We will provide dedicated serving and bar staff as needed. We provide family style meals, cocktail parties, receptions, showers, and more in our Lounge and Oak Room. we do allow separate tabs at the Oak Room bar. Events must end by 11:00pm. info@onebourbongr.com or call 616.608.5766 for more information. What is family style? 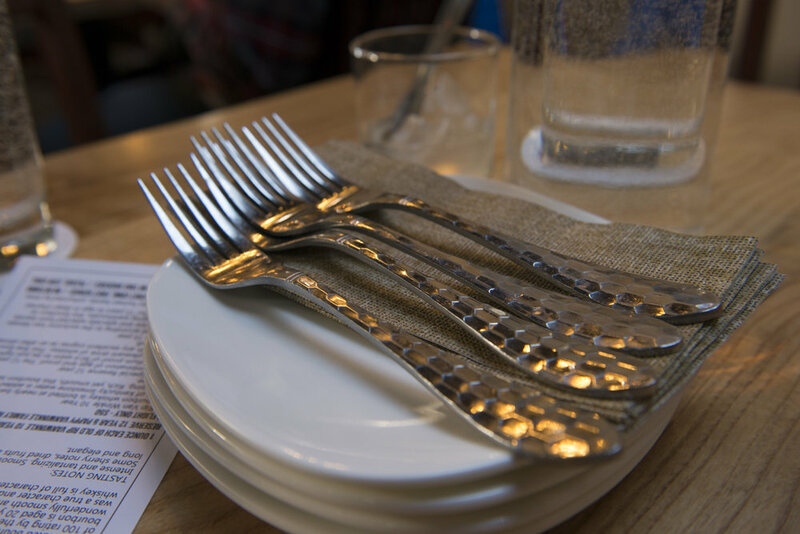 Your selections will be brought to the table on platters or in larger serving dishes after the salad course. Just like at home, pass the plates around and help yourselves! We want you to be comfortable, so take as much as you’d like and we will continue to refill the platters as necessary. Best for intimate events with guest count under 40. Buffet style meals - Your selections will be placed on a buffet line for your guests to help themselves, including the salad course. We will continue to refill the platters/chafers as necessary. Best for large parties over 40 people or groups with many dietary challenges such as allergies or preferences. Your selections will be placed at stations throughout the Lounge and Oak Room encouraging your guests to move and mingle. We will continue to refill your selections based on your pre-ordered amounts. One Bourbon does not allow the practice of “under ordering” for hors d’ oeuvres events. Your event planner will work with you to determine appropriate amounts of food selections for your size group/time. Best for networking events, after dinner parties or events where mingling is encouraged. Up to 75 people can be accommodated. Room can be set u-shape, boardroom, classroom, pods or varied with soft seating. Large TV for presentations. Space set with paper tablets, pens, extension cords and outlets, flip charts (2), white boards (2), tissue. fidgets, scissors, tape, markers and misc office supplies. Non alcoholic beverages available all day. Menu’s are custom, designed per group. Take a tour! Our friends at Real Space created a virtual realty tour for us. Click anywhere and use your mouse to "walk" around. Or, just hit the play button! You can even go up and down the stairs! Kidding. Kind of. We would love to introduce you to masters of this madness that we call One Bourbon. Hello! We are the owners and operators of One Bourbon in the heart of Bridge Street NW in Grand Rapids, MI. (West side, Best side, of course.) Brett and Meagan Freriks are both from Zeeland, MI and George and Meg Chittenden, from Spring Lake and Wayland respectively. The One Bourbon Story is pretty straightforward. We were having a Friendsgiving in 2015, bitching about work and we said "We should really just open our own restaurant" *sips bourbon* and then everyone agrees, and laughs and throws out a ton of random ideas. *sips bourbon* Everyone agrees again...and then the next thing we know, WHAM, Meagan writes a business plan. Oops. Why One Bourbon? Why bourbon? Why comfort food? Well, a couple of reasons. The name is from the legendary “One bourbon, one scotch and one beer by George Thourogood”. We thought it represented us down on our luck and not loving what we were doing. And we kinda agree that a bourbon, a scotch and a beer makes for a pretty fantastic evening. Why bourbon? Um…it’s tasty? But in actuality we wanted a place that showcased spirits (especially the brown ones) that had something for everyone. A place where you can get a HELL of a cocktail or sip on a Bud Light without judgement. Drink what you like! Why comfort food? GR has SO many great places with fabulous Chef’s that are uber creative and putting out some fantastic food. But sometimes, we just want a burger. Or fried chicken. Or homemade pie. Nothing fancy, so crazy sauces, nothing you have to Google search while you look through the menu. Good food. At a reasonable price (remember we are from West MI here and are just as broke as the next guy). delivering guests their meals, checking in on them and helping expedite the kitchen. (In real life, he is a Project Manager for a Telecommunications company.) Meg Chittenden will be running around as a "Utility Player" as we like to say, bartending, serving, expediting, etc. (Meg is in Operations at a local yoga studio). We have all worked in everything from diners, to resorts, to fine dining, corporations, you name it and have learned so much in the process. We thank all of our prior places of employment, bosses, peers and staff for the opportunities to learn. Without you we wouldn’t be where we are today. We took over the space in October 2016 and did so much work to this space that we are wildly proud of. From gutting the upstairs and totally renovating our private dining space to actually BUILDING a kitchen where we needed one. In true West MI fashion, what could be done by us, was. (We have also decided that we never, ever want to paint for a living.) Maybe there will be a HGTV show on us…”Flip This Restaurant”, who knows. your friends and meet some new ones. Hospitality is of great importance to us. We want you to feel like you are coming to a friend’s house for dinner. Be welcome here. We are incredibly grateful to have built a supportive team that stands behind the same ideas! It has been a dream come true and we are so thankful for everyone and their unconditional support through it all. A special shout out goes to our parents and families for helping renovate with us and for promising that we can live with you if this thing ever goes South. We love you!